Axminster carpet in 100% British Wool was specified for this landmark private residence, now the Mark Hopkins Intercontinental Hotel, San Francisco, USA. 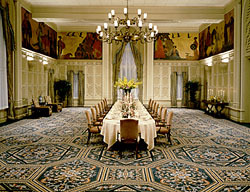 The designer required the carpet to exactly reproduce the ceiling paintings in the Room of the Dons and in the magnificent ballroom. Axminster carpets designed and made the carpet within 4 weeks with the help of their sophisticated computer programmes. Made up from 4 rolls, each 12 ft wide, the carpet was delivered and laid 5,000 miles away without the carpet designers ever seeing the location.